1 Semiotics and the sacred Om symbol – what does Om represent? 5 How long does the positivity last from an Om symbol that spontaneously appeared? For those interested in semiotics (the study of signs) the information provided in this article about the sacred Om symbol has been gained from other sacred texts such as the Upanishads and also through spiritual research using an advanced sixth sense. Through an advanced sixth sense, seekers of the spiritual research team are able to access subtle knowledge from the Universal Mind and Intellect. The following are some of the spiritual features about the Om symbol and what it signifies. The Om symbol is the manifest (saguṇ) form of the unmanifest (nirguṇ) God Principle, meaning it represents the Supreme God Principle. It can manifest in various ways depending on the cosmic principle. For example when it manifests as a subtle sound that people can hear it is because the Absolute Cosmic Ether (Ākāshtattva) principle is behind it. When it manifests as something we can see such as engraved on the floor it is because of the Absolute Cosmic Fire principle (Tējtattva). While the importance of the syllable Om is first described in a written format in the Upanishads, it has been in the Universe from its inception. At the start of creation nothing existed, it was a void and all of creation existed in a latent form. When God created the Universe, He did so through the sound of Om. This is why it is also known as the primal mantra (or pranava mantra) and the one which pervades the entire Universe. It is the original sound that pervades all other sounds, all words, all languages and all mantras and in essence the whole of creation. It is the closest one can get at a physical level to understanding the God principle. The Om syllable forms when the Sanskrut alphabets of ‘A’, ‘U’ and ‘M’ come together. As Om is the manifest form of the Supreme God Principle, when a seeker grows in his or her spiritual journey God first brings him or her to a stage where they can understand the manifest form of God which is the cosmic sound of Om (Shabda Brahman). Only then can they finally go to towards and realise the unmanifest Supreme God Principle (Parabrahman). From a seekers point of view when they are able to perceive Om though their subtle sense organs, this means that their spiritual practice has reached a higher level. Sages have given interpretations of the meaning behind A, U and M and what they stand for. These interpretations can vary depending on the audience being addressed. Om is the most spiritually pure (sāttvik) symbol that innately has God’s Principle. 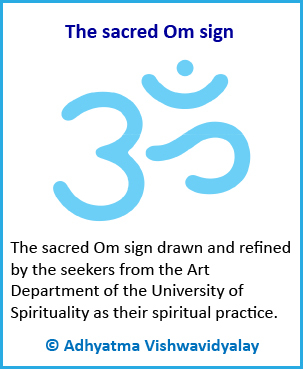 When the Om symbol appeared spontaneously in the Spiritual Research Centre and Ashram, it is indicative of the unmanifest, Omnipresent God manifesting. In order for Om to manifest spontaneously on surfaces the Absolute Cosmic Fire Principle needs to be behind the phenomenon. The sound of Om has also been heard by seekers in the premises of the Spiritual Research Centre and Ashram with the absence of any physical cause. This is also because of the increase in the Absolute Cosmic Ether Principle in the premises of the Spiritual Research Centre and Ashram. Nails and hair are predominantly comprised of the subtle Raja and Tama components. Even so a sattvik symbol such as Om appeared on the nails of His Holiness Dr Athavale and is a symbol of the God Principle (Shiv). This only happens when a person goes from the state of an embodied soul (Jiva) to a God-realised Soul (Shiv) that is who is spiritually pure and devoid of Raja and Tama components. The Divinity of the mission: Spiritual research about Om has revealed that by nature, Om rests only after imparting Absoluteness. It provides the energy for Creation, Sustenance and Dissolution. His Holiness Dr Athavale’s mission too is aimed at spiritually uplifting society and taking seekers towards Absoluteness (state of God-realisation) in their spiritual journey. Once many seekers progress spiritually, it will lay the foundation for the establishment of a Divine Kingdom on Earth. Thus, the widespread appearance of Om in the Spiritual Research Centre and Ashram is indicative of the Divinity of Parātpar Guru His Holiness Dr Athavale and His mission. When the mission transforms manifest to umanifest: Another reason is that, Om represents the unmanifest or nirgun Principle. So, when the collective (samashṭi) mission starts becoming very expansive, it gradually starts moving from the unmanifest or nirgun Principle to manifest in sagun which means it manifests everywhere. The same is happening with the mission of His Holiness Dr Athavale. The materialisation of Om indicates that the collective mission is beginning. Om signs have appeared on Saints and seekers and in various places near seekers because they are a reassurance from God to His devotee that He is there for them. One extraordinary example of this was when the Om sign appeared on the different body parts of H.H. Satyavan Kadam while he was in a meditative state. 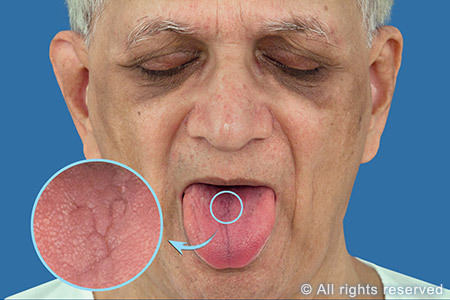 This spiritual phenomenon took place on 16 Sep 2012. The Om sign was seen on his face, cheeks, forehead and the mudra which he did with his fingers (Joining the tips of thumb and index finger), and many other places of his body. The appearance of the Om symbol at the Spiritual Research Centre and Ashram and on people is also indicative of Divine help and protection in the subtle battle between good and evil forces that is currently being waged for the most part at the Unmanifest level. 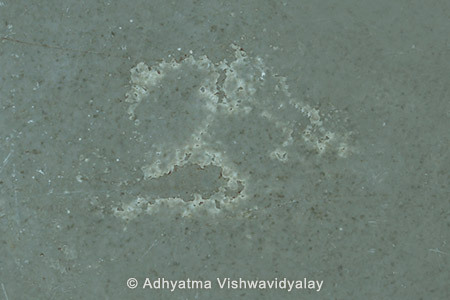 The impression of a face emitting negative vibrations appeared on the floor in the corridor adjacent to the Art department at the Spiritual Research Centre and Ashram. This was due to a negative energy attack. Within a short period of time on 6 Jun 2013, an Om sign appeared next to it. The spiritual reason of the appearance of the Om symbol on the floor was to counteract the negativity from the face. Om also appears due to an increase in the unmanifest God Principle in the ashram. The Guru of Dr Deepak Joshi had provided spiritual guidance to perform the Dashpranavi Gayatri Havan for the removal of negative subtle energy attacks on H.H. 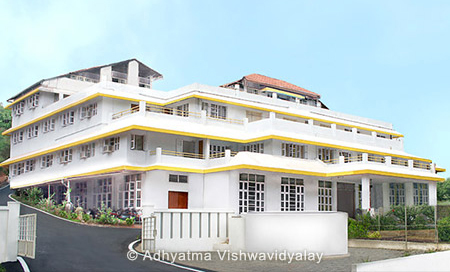 Dr Athavale and the Spiritual Research Centre and Ashram. The sacrificial fire (havan) was conducted in April 2013 from 6 to 8 am for a period of a month. When taking photographs of the sacrificial fire that was performed, many types of orbs were seen in the photographs and were even caught on video. In some of the orbs, the Om sign was seen. When a person does spiritual practice, the spiritually pure component or the Sattva component in them rises, and they have a higher level of the unmanifest God Principle in them. When they die, their subtle bodies when caught on camera as orbs can display the Om sign. Such subtle bodies are active in the subtle at spiritually pure places. Also sometimes they come for getting liberated as well or for getting the spiritual energy to get momentum in their journey in the afterlife (gati). In Jan 2013 at the Spiritual Research Centre and Ashram a Pravargya ritual was done by H.H. Nana Kale under the Somyadnya sacrificial fires. When the oblations were made to the sacrificial fire the Om sign was seen in the fire. The appearance or darshan of Om means a signal from God that the sacrificial fire was complete and successful. Using their spiritual powers, higher level negative energies can create the ‘Om’ symbol and fill it with illusory energy. Even though their appearance may seem miraculous one would not gain any positivity from such seemingly positive symbols. In fact, they would emit negative vibrations. The difference between a sattvik Om and illusory (māyāvī) Om can be felt only through vibrations that they emit. Only Saints and seekers with advanced sixth sense can tell if the vibrations emitted are real or illusory. The Om signs that have appeared on the tiles of the Spiritual Research Centre in Jun 2012 andspread spiritually positive vibrations into the surrounding environment. Each Om sign exerts an influence of approximately 30 yards (which is over 27 metres). Outside the Spiritual Research Centre even if the shape remains the same, the energy in the Om symbol may be different. It may be much stronger as per the need of the seekers in the area or the mission. The strength of the energy emanating from the Om is lesser in the Spiritual Research Centre because the spiritual purity in the premises is already very high. The spiritual energy associated with an Om symbol that has spontaneously appeared (in non-perishable items) is retained in it for approximately 1 year. If there is a need, the duration of retention of spiritual energy can get extended by Divine intervention. Otherwise, generally after a year from its appearance, the spiritual energy from it diminishes. If the unmanifest Principle is needed for the Divine mission, God automatically provides new appearances of the Om symbol or spiritual energy is reinstated back into the same symbol. His Divine mission of taking many seekers towards the Final Liberation and Reinstating Dharma throughout the world. The appearance of such a sattvik symbol, especially Om, is very rare in any place. Even if it does appear any sacred symbol is not able to remain for extended periods of time because it is immediately attacked and neutralised by negative energies. When one performs spiritual practice with an understanding of Spirituality; only then can one understand the spiritual dimension. It is important to have advanced sixth sense to be able to understand whether an auspicious sign which has appeared on one’s premises is positive or negative in nature. Due to spiritual practice a person’s spiritual purity or sāttviktā begins to increase. As one’s spiritual practice deepens, one begins to understand the subtle dimension, which is beyond the 5 senses, mind and intellect. At this point one may not necessarily believe or take what the eye can see as the truth. Instead by concentrating one’s mind on a phenomenon such as this, one is able to perceive the positive or negative vibrations emanating from it. As a result, one begins to take a more holistic approach to understanding or analysing the findings as one is able to experience it at a spiritual level. What is the subtle battle between good and evil? What are Sattva, Raja and Tama?